The maximum of the probability density distribution of phase fluctuations in the earth’s atmosphere, as a function of point separation, was measured visually in white light for starlight observed from the ground with a 1.5 m astronomical telescope. A wave-front folding interferometer was used. 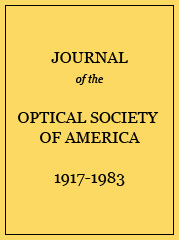 Measured peak-to-peak fringe amplitude and peak-to-peak total physical motion (1) required for active optics compensation as a function of point separation (d) at the telescope pupil. Average of 3 nights observations on each of 4 stars.